"A thrilling new fantasy series brought to you by Big Fish Games." A thrilling new fantasy series, Dreampath: The Two Kingdoms Collector's Edition is developed by Boolat Games which are the makers of Timeless: The Forgotten Town and Dark Case: The Blood Ruby. With another video game release, Dreampath: The Two Kingdoms Collector's Edition is an adventure game which is brought to you by Big Fish Games. In this installment of the game, the doctors have failed and now your sister, the Queen, lies on her deathbed and you are her last hope. There is a mystical cure that exists in a far away kingdom named Goldthorne, which is a place that no one dares go to since the last king to have held the thrown had vanished in the past. You must have the courage to deal with the unknown with in the game and save your sister. As you play the game, you must find out how to save your sister through the mysterious tale. 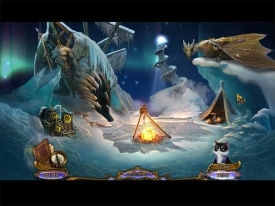 Like a lot of Big Fish Games, you must solve puzzles to achieve in this adventure. You will soar high into a world of floating islands, talking cats, and magical dragons. Just take notice that the sinister forces are keeping an eye on you from the shadows. In this download, you will get the free trial of the Collector's Edition of the game. You will be able to join Muir, the cat, in a bonus adventure as well as play a secret game with King Harald and Muir. Collect silver and gold tokens to decorate the Cat Room, as well as get a strategy guide, concept art, wallpapers, video, music, and mini games.